On Monday, May 12th, Imagethief was on the 27th floor of the Kerry Center for a meeting at 2:28PM. We all spent a couple of spooky minutes at the window watching Kerry and Fortune Plaza sway alarmingly, not knowing that it was just the faintest echo of a far-away unfolding catastrophe. As a San Franciscan who has been through countless little quakes and one whopper (1989′s Loma Prieta quake, during which I was living in heavily-hit Santa Cruz), I was at first convinced that our tedious and sweaty walk down endless flights of stairs was an overreaction to a trifling local quake. Only when my colleagues began getting SMS messages from friends in Shenzhen and Chengdu did I realize we’d been at the extremity of something terrible and distant. An amazing and heart-wrenching story has unfolded in the ten days since. Some of the images that have circulated are still stuck in my head. A journalist acquaintance that I bumped into on Saturday had spent time in devastated Beichuan. He said, simply and soberly, that it would stay with him for a while. My office is in Oriental Plaza, just about half a kilometer up the road from Tian’anmen Square. Since I had a bit of free time during the afternoon I decided to walk down to the square for last Monday afternoon’s three minute remembrance of the victims, held exactly one week after the quake. I thought it would be a nice way to book-end a sad week and, to be honest, I was interested to see the scene. I’d had lunch that afternoon with Chinese propaganda expert Stefan Landsberger, who had told me he felt that day’s ceremony was an historic public acknowledgment of a domestic tragedy (an opinion also argued by Paul Denlinger at The China Vortex). One only gets so many chances to witness history, especially when it’s unfolding just up the road. There was a big crowd flowing toward the square. I’d cut the timing close, and people were anxious to be out on the square when the ceremony began. In the final moments people were running through the underpasses that lead onto the square, hoping the beat the announcement and defying the police offers trying valiantly to maintain order in the tunnels. Even I, conspicuously overdressed in a jacket and tie, broke into a jog at the last few steps as I watched the time tick toward 2:18. There were thousands of people already gathered, with the crowd thickening toward around a roped off area that encompassed the main flagpole. I couldn’t see what or who else might have been there. It wasn’t any of the senior leaders, all of whom observed the ceremony from the fastness of Zhongnanhai. There were also several CCTV satellite trucks and many camera crews roaming about, including one camera high up on a crane, overlooking the crowd. That wasn’t surprising. The event had a made-for-TV feel about it. An abundance of the little, red, plastic Chinese flags that I associate with National Day made the mood seem at once reflective and oddly festive. Hundreds of people were holding camera phones above their heads, trying to capture the moment. I don’t doubt the sincerity or depth of feeling of the people there, or anywhere in China, but it occurred to me as I watched a camera crews scanning the crowd that I was participating in a moment of crafted post-quake propaganda. At 2:28PM an sonorous voice intoned Beijing time. The crowd fell silent and horns all around started blaring. There in the gaze of Mao’s portrait we all stood for three minutes with our heads bowed. At the end of the observance the crowd shifted into life. Some people started drifting back toward the underpasses. From the front of the crowd came a chant of “Go, China!” (中国加油!). In fact, what I heard near me initially was “Long live China!” (中国万岁!). It started scattered but gained strength, ebbing and flowing through the crowd. After a few moments the crowd was pumping fists into the air in unison. A photographer standing on the base of a lamp post nearby was particularly vigorous, rousing the people around him into the chant. Amidst the display of national pride I became acutely aware of my foreignness and decided to move out of the thickest part of the crowd. The chant was still going as I walked back toward the underpass. A video can be found here (H/T China Digital Times). Honestly, I was surprised. The fist-pumping chant seemed somehow inappropriate for the occasion. Not that the Chinese shouldn’t be proud of their nation and the response it has mustered to the quake. But a solemn remembrance had shifted in moments into a vigorous nationalist rally. I had expected something more restrained, along the lines of a candlelight vigil. But this is the first time the Chinese have had such a public memorial in the wake of a civilian tragedy. There is no template for how something like this should go here. The scene made me think that Twitter comments, articles and blog posts from earlier this week describing the quake as “China’s 9/11″ might be on to something. 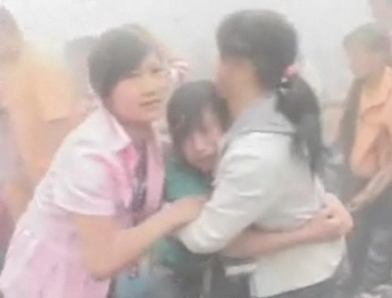 (For a spooky, visual 9/11 parallel, go to the NBC News site and watch the May 18 clip “First images of the quake”, showing the immediate aftermath in destroyed Beichuan). 9/11 was a devastating blow to American national pride and self confidence. Could this event reverberate similarly strongly through the Chinese national consciousness? Looking at the reaction across the country, it is easy to imagine so. The covers of the memorial newspapers, nicely collected in collage by Chinese blogger Hecaitou (H/TDanwei), are reminiscent of the stark and shocked reporting that followed 9/11. The nationwide outpouring of solidarity (also here) and charity and the celebration of heroic rescue workers is also reminiscent of 9/11. There are other parallels as well. China is no stranger to sweeping catastrophe and mass fatality, but this is the first disaster of this scope of China’s post-reform period. That makes it China’s first true mass-media disaster and, in parallel with 9/11 in the US, China’s first Internet disaster, shared in real-time across the entire country and around the world. In fact, considering technological developments since 2001, the Internet plays a much more important role in the public experience of China’s quake than it did for 9/11, which was largely defined by television images. The prospect of this being “China’s 9/11″ is perhaps a little worrying. In some ways, 9/11 drew America together. It even briefly brought America closer to much of the rest of the world, including some perennial rivals. But, as traumas will, it also unleashed pathologies. In the US those included the prosecution of a war of choice; elevation of security to national ideology; public justification of torture; a surge of angry nationalism (the Chinese don’t have a monopoly on it) that made questioning of government less acceptable even as fundamental freedoms and balances were eroded; an obsession with shallow symbols of patriotism such as lapel flags; and so on. 9/11 was an external event that allowed much, though not all, of America’s anger and grief to be directed outward. China’s earthquake is an internal event. There are no plausible outside forces to blame. The burning questions being asked now are about why a reported 7000 schools collapsed. These questions are given urgency by the pathetic and politically powerful photos (warning: not for the sensitive) of the bodies of primary school students huddled in wreckage. 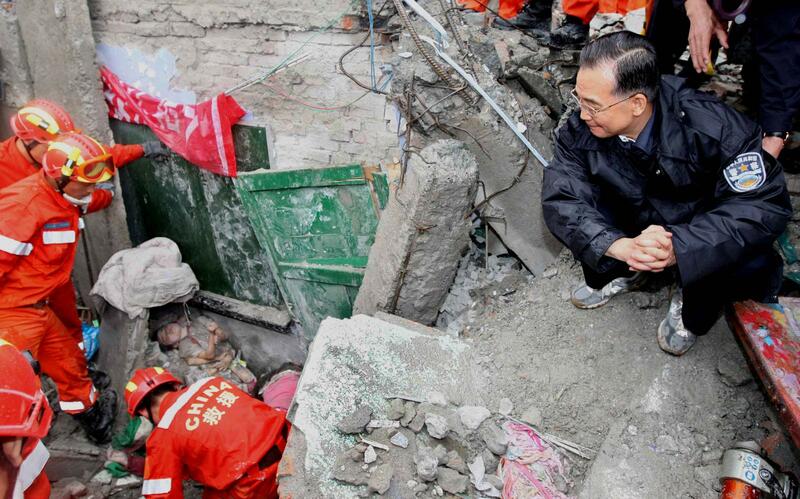 Interestingly, that image was effectively co-opted by Premier Wen Jiabao when he was photographed amid the wreckage, looking at the bodies of students (also not for the faint of heart). An American president would almost certainly not be allowed by his communications team to be photographed in such graphic circumstances. So if this is China’s 9/11, where will the Chinese direct their anger and grief as shock begins to wear off? It occurs to me that the earthquake, a true national trauma, might have two possible effects on the current prevailing mood of prickly nationalism. Either it could feed into the nationalist sentiment, and possibly provide fresh impetus for it. Or it might make the nation take a breath and perhaps refocus its energies more constructively. With the Olympics less than three months off, I rather hope for the latter, but the reaction I saw on the square makes me wonder if the former is more likely. So does the degeneration of the nationwide charity drive into a competition in which job threats, Internet floggings and angry SMS campaigns are directed against individuals and companies, especially foreign ones, seen to have been slow or miserly in their contributions. One pocket of a nationwide observance is hardly representative, and a poor basis on which to draw sweeping conclusions. A chant is just a chant. Extreme Internet comments are notvox populi. China is not America, and 5/12 was a in the end a very different event than 9/11. The comparison can be easily overblown. Nevertheless, I wonder what place the quake will occupy in the Chinese national consciousness as we slog the rest of the way through this troubled year. Shrouded in dust: China’s 9/11? This entry was posted in Uncategorized and tagged China, China in the News, Nationalism, Politics. Bookmark the permalink.